Fashion editor and style expert Jacqui Stafford's new fashion bible proves that you don t have to be skinny or rich to look and feel fabulous. With her signature cheeky British humor, Jacqui takes the mystery out of: How to figure out your body shape to create your ideal body (Are you a Cocktail Ring or Sunglasses? A Fragrance Bottle or Lipstick?) How to make the plainest outfit dazzle with the right accessories What are the definitive beauty and skincare products that really get results (and why you can forget the rest) Where, and why, fashion editors shop when they do How to follow hard-to-wear fashion trends (and which trends to ignore) Why some women look super wealthy (even if they're not) And much, much more. 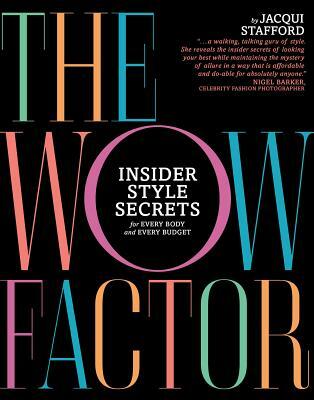 A global fashion editor, stylist and TV personality, Jacqui Stafford's work on style and beauty has appeared in "Vogue, Marie Claire, Lucky, Cosmopolitan, Real Simple, Town & Country and Shape," and she dispels her style advice on everything from "Today "to "ET." She has served as the style ambassador for Slim-Fast, Avenue, Bali bras, Woolite and the Estee Lauder-owned brand, Eyes by Design. She currently appears on QVC for Isaac Mizrahi. She lives in New York City."